For over a decade, I have been designing leather goods. I love brainstorm creative ideas in the beginning stages, but I also have a technical background has helped me to execute designs with well thought out details. Collaborating with sample makers and craftspeople to ensure top notch products is a high light. All of these things have lead to exciting opportunities like a three month project in Ethiopia, where I designed a collection, and helped a workshop, who hires marginalized youth, develop better finishing techniques. In 2017, I was also selected for a shoe design residency in Seoul, where I spent two and half months developing a capsule collection with a local shoe master craftsman. Since 2016, I have had the exciting opportunity to design home decor under the brand Circle and Line. 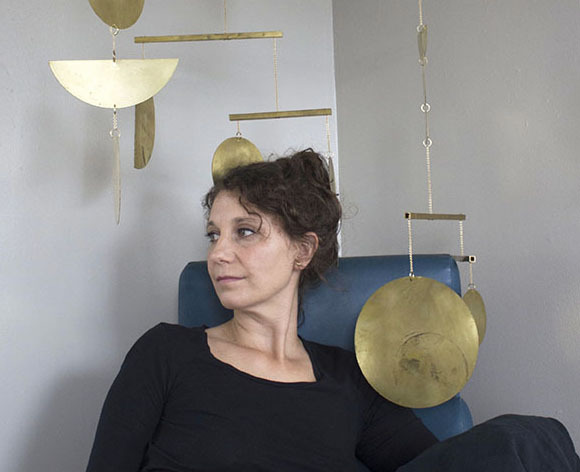 The mobiles started with trying to adding jewelry to my portfolio, however, I found the small scale cumbersome, and I made a collection of mobiles which can now be purchased at Anthropologie, The Citizenry or my own homeware brand Circle and Line.